The fascination with the MacGregor 26 trailerable sailboat continued for several years, but it diminished briefly in the summer of 1999 while Nan and I were in Manitowoc, Wisconsin for the wedding of her youngest sister Sarah to Ian Griffiths. At the reception, we sat at a table with Nan's brother Jim and his best buddy Jack Simono. 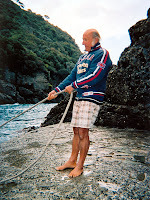 Jack was a long-time sailor who owned a Coronado 25 that he sailed on Lake Michigan. But the boat had been sitting unused in his backyard for a couple of years and he was ready to sell it. He thought it was worth about $7000, which was less than half what a new MacGregor 26 would cost, so I was very interested. When we got home, I searched the Internet and found a PDF version of the original Coronado 25 brochure. It looked like a sturdy, capable cruiser, more of a true sailboat than the MacGregor 26X power cruiser. I would have contacted Jack to work out a deal but like the dreams that preceded it, there was no money to fulfill it and it slowly died. Later that summer, I made a pilgrimage to Colorado's only MacGregor dealer, The Anchorage, located just north of Boulder and only a four-hour drive away. 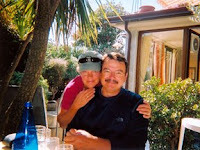 The owners, Eileen and John, let me climb around on a brand-new MacGregor 26X and gave me literature and a price sheet. I left convinced that the MacGregor was the right boat for me after all. And I rationalized that it would be easier to come up with financing for a new boat than for an older, used boat. We might have qualified for a home equity loan, but the mortgage on our Aspen home was oppressive enough without taking on additional debt, so I never got past checking interest rates and calculating monthly payments. That fall, Nan and I attended the wedding of Erika and Mike in Moab, Utah. Erika and Nan worked together in the pharmacy at Aspen Valley Hospital. Their boss, the pharmacy director Dan Gold, was also a guest at the wedding. Nan had been eager for me to meet Dan because she thought we had many interests in common, including sailing. Dan was late getting to the sunset wedding after riding the challenging Monitor and Merrimac trail on his mountain bike, so we met only briefly before the ceremony, which took place beneath one of the arches in Arches National Park. The reception was a low-key affair at Eddie McStiff's brew pub, where Dan and I talked sailing and became friends over pitchers of microbrew. Like me, Dan was a believer in the MacGregor 26, in his case because he owned one, a 1992 MacGregor 26D. Time passes so quickly these days, our Christmas letters are starting to read like chapters in a serialized novel. By the time the last one has been mailed, it’s time to start thinking about the next. What to do for a cliffhanger though? This year was a big one for us. We made up for all the travel and experiences we didn’t get to do last year while we were going through our home ownership transition. Much of that travel was the back-and-forth shuffle between our jobs at Aspen Valley Hospital and our home in Grand Junction. We shared a house down the road from Aspen in Basalt during the work week and drove home every weekend, partly to water the plants and check the mail, partly because it was home and it felt right to be there. But as of November 1st, when Nan ended her nineteen-year career at AVH, we are now full-time Grand Junctionites. Nan just started a new job here as Surgery Coordinator for Community Hospital, and I am telecommuting now to my job as the Database/Internet Administrator for AVH. It’s working out well so far, and our dog Charlie seems less confused. The fun travel started last January. I was looking to expand my sailing horizons so I joined sailor/writer John Kretschmer and a group sailing John’s 47-foot cutter from Fort Lauderdale to the Bahamas and back. It was rough crossing the Gulf Stream overnight while beating into the wind, but we enjoyed the Settlement on Grand Bahama and the quick surf back. It was smooth enough on the return to practice using sextants to determine our latitude, confirming our position with the ship’s GPS. To build her sailing confidence in anticipation of our upcoming May sailing trip to the British Virgin Islands, Nan took the American Sailing Association basic keelboat class in St. Petersburg, Florida in April. She surprised herself by passing both the written and practical exams. Our Christmas picture this year shows Nan happily putting her new knowledge to work at the helm of the boat we chartered in the BVI. The May sailing trip was a dream, especially compared to our 2004 misadventure. Chartering a larger, safer boat and having Nan’s sister Monica and her friend Vicky along made all the difference. It was a first-time experience for both of them, but after they got over the feeling that the boat was going to tip over when it heeled, they pitched in on all the sailing duties. Good weather, smooth seas, excellent snorkeling and plenty of conch fritters kept everybody happy. In August we visited family, Nan hers and me mine. Nan went home to Manitowoc to celebrate two milestone birthdays, sister Sue’s 60th and sister Amy’s 50th. Sister Sarah, the ninth and final Mullins daughter, and her husband Ian hosted the festivities at their home in Green Bay, complete with a This Is Your Life-style trivia contest. I drove to Washington State with Charlie for a week-long Lichty family reunion celebration of Mom and Dad’s 50th wedding anniversary at sister Jane and her husband Josh’s homes on Whidbey Island and in Seattle. We toured the island, we hiked the beaches, and Charlie experienced sea water for the first time, prompting him to puke in the back of Jane’s van. Back in Seattle, we visited the art museum and aquarium, and celebrated Jane and Josh’s twins Max and Ben’s 10th birthdays. 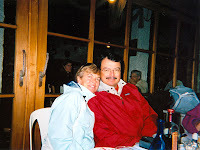 In September we traveled to Italy for the first time. We wandered around Florence for a few days, reliving the Renaissance through the architecture of the Duomo and the artwork at the Ufizzi gallery, all the while partaking of the great food and wine. Then we took the train to the coast to meet up with The Wayfarers for a week-long package walking tour of the Cinque Terre and Italian Riviera with a terrific group of fellow Americans. The coastal views of the Mediterranean and the compact, pastel-colored towns were spectacular. At a walking pace, putting in about ten miles a day, we had plenty of time to appreciate them. If you’d like to see for yourself and you have a high-speed Internet connection, there are slideshows with captions on my blog at http://whisperingjesse.blogspot.com. After the hike ended, we stopped in Pisa to see the Leaning Tower on our way back to Florence, where we spent another day that included a visit to the Academia museum to see Michelangelo’s David. October saw us witnessing Brett Favre’s bomb to Greg Jennings to beat the Denver Broncos in overtime. It does the heart good to see an athlete past his prime having probably his best season ever. Maybe Brett will have one more chance at a Super Bowl before he retires. Maybe he’ll play another season. Either way, go, Pack, go! After that whirlwind of travel and the job and living adjustments, we’re happy now to be spending time settling into new routines and finally unpacking the last of the boxes from our move more than two years ago. There’s snow on the high desert, making for a rare white Christmas and good skiing at Powderhorn. We’ll be here enjoying both this holiday season. Here’s hoping for plenty of snow and the best this season has to offer for you and yours, now and in the New Year. 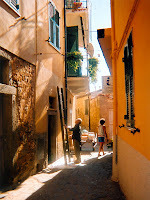 Street scene in Campiglia on the first day of our Cinque Terre hike. The gentleman with the ladder is adding another coat of pastel-colored paint to the wall of a shop. Our Wayfarers walking group having a big laugh at George's expense. He was late for our departure from Riomaggiore on the second day of our hike, so we ducked into a garage down the street from our hotel and surprised him as he hurried to catch up. 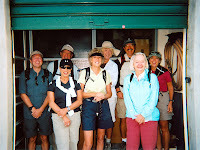 Left to right are our guide Paolo, Pauline, Burton, Jean, Barbara, me, Virginia and Nan. While we waited for George, an old man carrying a little boy stopped and asked, "Is it raining?" That was an even bigger laugh. 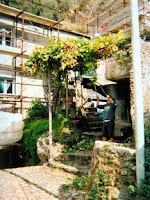 Instead of hiking along the shore between Manorola and Corniglia, we went up and over the large hill that separates them, passing through Volastra where this gentleman was using long-handled shears to harvest grapes from the arbor outside his home. Lunch under the palm trees in Corniglia, the middle one of the five Cinque Terre towns. This was day two of our hike, which took us from Riomaggiore through Manorola and Corniglia to Vernazza. 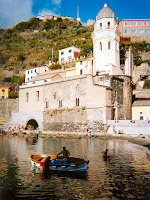 The beach and harbor in Vernazza, our favorite Cinque Terre town and the place where our second day of hiking ended. From there we took a train to Sestri Levante to begin the Italian Riviera portion of our hike. 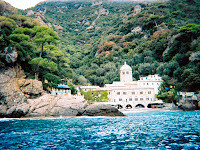 Approaching San Fruttuoso by ferry from Punta Chiappa. The church dates from about the fourth century and is the final resting place of many members of the Andrea Doria family. Ferryman at the San Fruttuoso dock. It was chilly and sprinkling rain, but he seemed comfortable in his sweater, Madras shorts and bare feet. Lunch on the balcony outside the main restaurant at San Fruttuoso. There was a canopy to protect us from the rain as we enjoyed the food and the view. 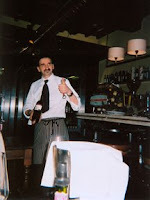 Moreno, waiter extraordinaire, at La Bussola in Florence (www.labussolafirenze.it) on our final night in Italy. The restaurant was recommended to us by the concierge at our hotel because it was just around the corner, but we ate dinner there three times during our trip because of the great food and service. 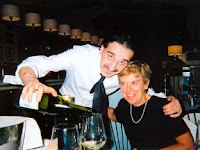 Moreno hams it up for the camera as he pours Nan a glass of vino bianco. Salute! In a press conference today, President Bush responded to questions about the newly released National Intelligence Estimate on Iran with this: "Iran was dangerous. Iran is dangerous. And Iran will be dangerous if they have the knowledge necessary to make a nuclear weapon. I think it is very important for the international community to recognize the fact that if Iran were to develop the knowledge that they could transfer to a clandestine program, it would create a danger to the world. And so, I view this report as a warning signal that they had the program, they halted the program. 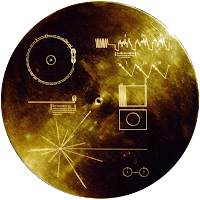 The reason why it's a warning signal is they could restart it." Instead of letting out a big sigh of relief over the fact that Iran has abandoned its nuclear weapons program, indeed that it had done so more than four years ago, back in 2003, Bush attempted to turn the tables, essentially posturing that he was right all along about the threat from Iran. This is especially alarming given that his administration knew back in August that intelligence estimates on Iran were in the process of being re-evaluated. Still he continued to warn of a potential World War III if America did not maintain its aggressive foreign policy position, leading many Americans to expect that we would soon be bombing Iran. Now it all seems to be just another of Bush's cheesy political ploys--a power play in the run-up to the 2008 election or a chance to bolster his legacy as the "War President"--remarkably and tragically similar to the fake intelligence that led us into the Iraq quagmire. Fool us once, shame on you. Fool us twice, shame on us? I don't think so. This might have worked in the fictional world of George Orwell's 1984, where thanks to "newspeak," black was white, up was down, and left was right, but like the book's Winston character, after our brains stop flopping around in our heads, we realize that this latest gaff is so transparent that any shred of credibility left in this presidency is now completely gone. The legacy? How about "Worst President Ever." Late in the summer of 1996, Phil LeBoutillier gave me a copy of September's Cruising World magazine. It contained a review of the Com-Pac 25, a compact--as the name implies--but comfortably set-up cruising sloop. I forgot about trying to build a boat from scratch as I read and reread that review, studying the pictures for every possible detail. The most intriguing thing to me was that the boat was trailerable. As a landlocked Coloradoan, that opened up all kinds of possibilities. Instead of traveling to the boat to sail it, I could trailer the boat to where I wanted to sail, whether it was some large reservoir or the Gulf of California. At the end of the review, in the specifications table, I always came up against the hitch: a list price of $36,000. My computer business was having its best year ever, but there was just no way to afford it. That didn't dissuade me from emailing Gerry Hutchins at Com-Pac (www.com-pacyachts.com) and requesting the brochure and price list though. Or, when my parents invited me to join them at their new vacation home in Savannah that following spring, from emailing Gerry to see if I could arrange a side trip to tour the Com-Pac headquarters in Clearwater, Florida. He said I should contact him when I got there, but I never did. It was a 350-mile drive, I would have had to rent a car, and at some point I would have had to say, "Thanks for taking the time to show me around, but I can't really afford to buy one of your boats." That fantasy pretty much died right there. Only to be replaced by a new one, of course. I can't remember now how I heard about it, but before long I was fascinated by the MacGregor 26 (www.macgregor26.com), another trailerable sailboat, but featuring a water ballast system instead of a keel, at the almost-affordable price of $15,000 (in 1997). The trade-off was that nobody was going to safely sail around the world in a water-ballasted boat. I read one account online of somebody crossing the Gulf Stream from Florida to Bimini in a MacGregor, and even though he did it using just the outboard motor and no sails to make it a fast trip, he still said it was the scariest thing he ever did. So maybe the MacGregor could be the coastal-cruising "trainer" on the way to something bigger and better someday?